This undernourished eco-thriller about giant Komodo dragons was directed by experienced special effects artist Michael Lantieri, explaining why the CGI effects are of quite a good standard. The rest of the film, about a traumatised young man being helped by a young doctor (Law and Order’s Jill Hennessy), is relentlessly dull, though, and barely rises above B-movie status. The UK rental disc offers a patchy 1.78:1 anamorphic widescreen presentation of what must have been a difficult film to transfer, (much of it takes place in low-lighting situations, and it has a muddy palette). Despite the sleeve’s claims to a 5.1 presentation, the disc only contains a relatively flat sounding 2.0 stereo mix (at 192kbps), which doesn’t enhance the film nearly as much as a 5.1 presentation might have. The disc does feature a number of incidental extras, including an eleven-minute Making of… that reveals that the film, which is set in South Carolina, was shot in Australia. The disc also trumpets an “exclusive preview” (trailer) for Ginger Snaps, a modern-day twist on the werewolf myth. 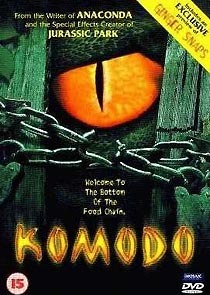 This trailer earned the 12-certificate Komodo a 15-certificate DVD release. The US disc offers some additional features, including a commentary track, another short featurette and the sorely missed 5.1 sound mix.